This article was originally written in September 2012. I have added an update 2 years later in September 2014. Back in 1999 when I bought the Patrol the first accessory I wanted (after the bullbar/roofrack/cargo barrier that I ordered it with) was a decent set of driving lights. Living in country SA and travelling regularly to Adelaide we spent a lot of time driving through roo country at night. Our previous Patrol had a set of Narva spots which were good but not great. Hella, Cibie and IPF were the gun brands and Lightforce were new on the scene. Based on reputation and apparent build quality I went with the Hella Rally 4000 lights. One spot pattern and one broad beam. I dismissed the Lightforce mainly on the basis that plastic lenses were an unknown and also I didn’t like the idea of two huge dinner plates blocking the airflow to the turbodiesel. The Hellas proved to be durable, watertight and great over long distance driving. Only downside was visible vibration of the spot beam on corrugated gravel roads. Stays are available to brace the top of the light but I never pursued them. Jump forward ten years to 2009 and I made the technological leap to HID. Rather than buying new lights I bought a conversion kit for the Rally 4000s. This comprised two HID lamps (55watt, 5000K), two ballasts and comprehensive instructions on how to convert my spotlights to the brave new world of lighting. The cold start delay with HID lighting was occasionally annoying, as was excessive glare from distant road signs, but generally I was happy with their performance. Less pleasing was the failure of a ballast unit and later a globe. Good lighting but expensive upkeep! When another ballast unit (or globe – haven’t checked yet) recently died I decided to have a look at what else was on the market, including going back to 100w or even 130w halogen globes. Given the good record of durability of the lights (12 years and 170,000km of offroad and outback) this was a real option. 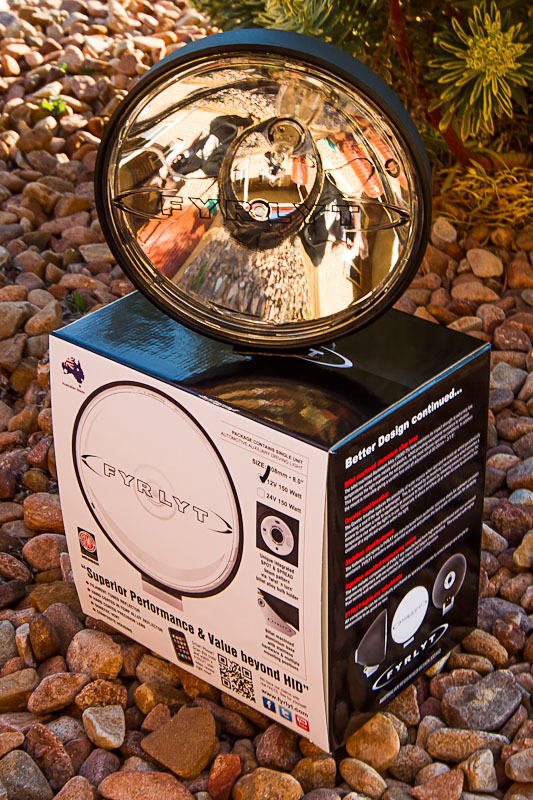 At around this time a friend recommended I have a look at the FYRLYT driving lights that have been on the market for over a year. Their claim was HID output with halogen reliability and simplicity. As a 150w lamp unit the obvious downside compared to HID was current draw and voltage sensitivity. Being a sucker for new technology (and a good marketing blurb) I whipped out the credit card, bought a pair over the phone and a few days later I had a parcel containing two lights from Fyrlyt. First impressions – professional packaging, well made, solid mounting, visibly smaller than the Hellas and with a good gimmick of being able to adjust from spot to spread beam with a 180 degree turn of a switch on the rear of the light. This appears to move the globe in and out changing the focal point of the beam. Another feature from the sales spiel is that all components, including the lens, are available as individual spare/replacement parts. I wanted to test the Fyrlyt claims so I removed the spread beam Hella from the bullbar (the light that had stopped working) and installed the new light. I then hooked it up using my existing wiring. This meant that both lamps would come on together, powered by the same relay and battery. Powering them up for the first time, and shining at close range onto the front of my campertrailer, gave several immediate impressions. 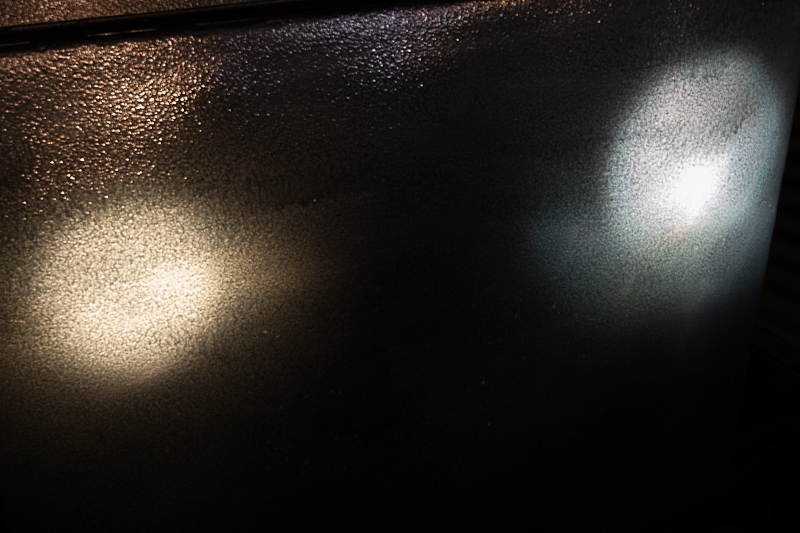 Firstly, the halogen is very yellow compared to the blue-white hue of HID. Secondly, the HID was considerably brighter. I then took photos of each light when illuminated. 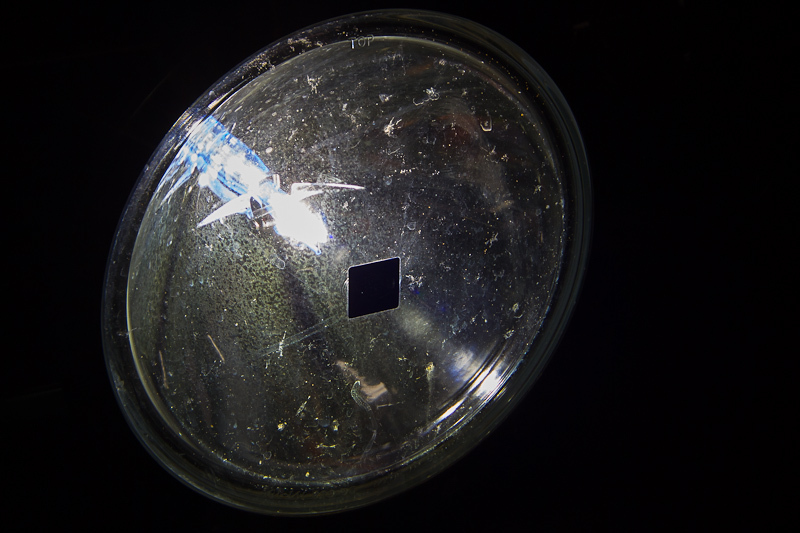 Don’t use these photos as a guide to relative output as I adjusted the exposure of them to best display the actual lamp, although the colour rendered is accurate. By now it was dark outside so I jumped into the Patrol and headed down the road to the local showgrounds. This is a wide open area with some convenient reflecting posts at regular intervals and distant trees and buildings. 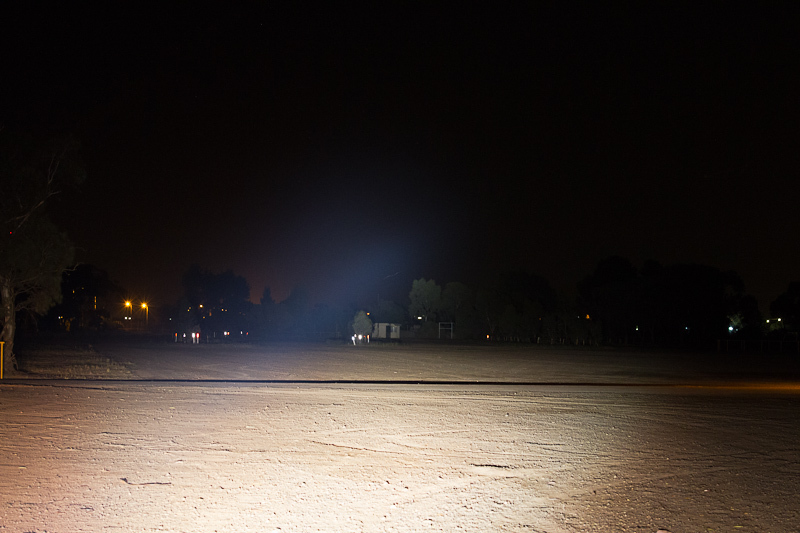 Perfect for testing spotlight range and quality without annoying other motorists. Once I’d set up the camera and tripod I proceeded with aligning the two lights for best compromise of range and general light. To do this I used the white plastic Hella light cover to blank off either of the lights. I also used this technique to do the actual testing. The testing results were pretty straightforward. The Fyrlyts were pretty good but the HID Hella combo was way better. Surprised, disappointed and slightly annoyed I headed home. Pondering this result in the shed, with a beer, as you do, I rang a mate (I’d like to phone a friend Eddie) who is a sparky with extensive knowledge of 12V systems. His suggestions were either undersized cables (for 150w lamps), a too small relay or possibly I was a victim of marketing hype. Sadly he knows me well enough to assume it’s probably the latter one. On his suggestion I pulled out the multimeter to check a few things. To my horror I quickly found that only 11.6volts were getting to the Fyrlyt. I made up some “jumper leads” and set up a piggy back arrangement where I could have the lights running on 11.6 volts and then add a second power cable directly from the battery terminal to the lights. When I clipped the jumper onto the battery terminal (without a fuse – thrillseeker!) there was an instant dramatic increase in brightness from the Fyrlyt. 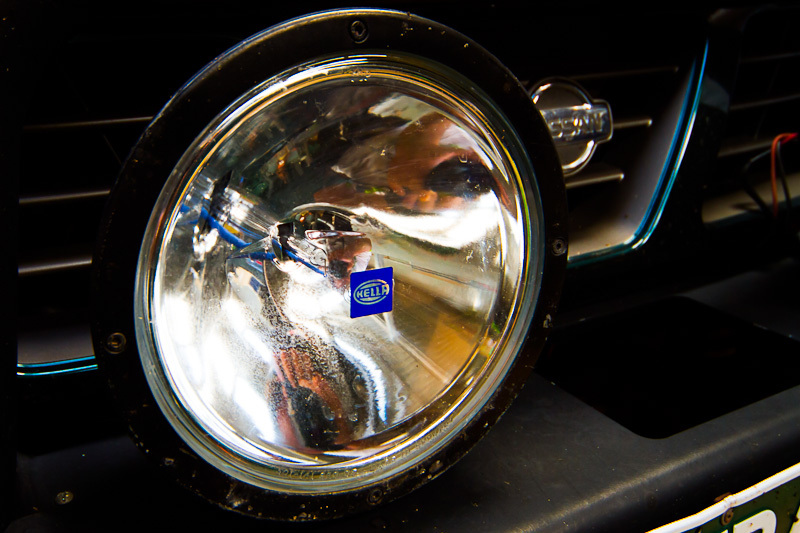 The HID remained unchanged. I repeated this several times by attaching and removing the jumper from the battery and the result was always the same. The culprit was the female spade fitting at the relay end of the cable between relay and light. Moisture must have gotten in, despite my best dodgy sparking skills, and corroded the cable and fitting. Cutting about 100mm of cable off and attaching a new fitting now had me getting 12.5volts at the lamp and much improved performance. Back to the showgrounds and again I set up the camera and tripod, realigned the lamps and proceeded to test them again. The results this time were much closer. Firstly though there wasn’t a huge difference between the spot setting and the spread setting on the Fyrlyt. Spread is maybe twenty percent wider but only a small noticeable drop in distance. With both lights running in spot mode (no choice with the Hella) the reach distance was very similar with light levels on the distant trees and building being about the same with the HID maybe brighter. 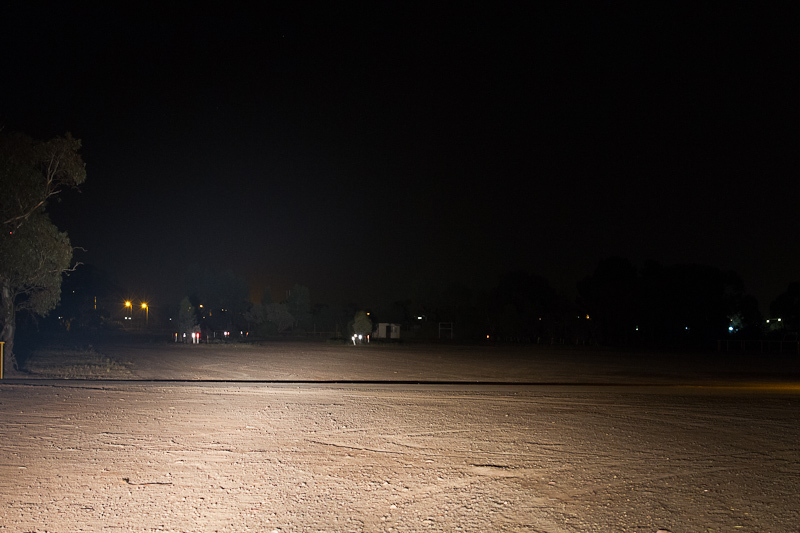 The foreground with the HID though was much brighter but with more of a defined “spot”. 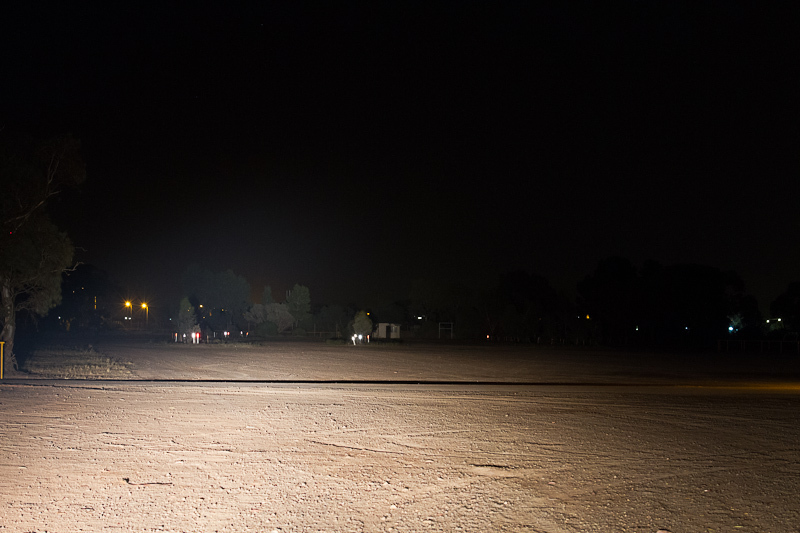 The HID colour was more like daylight, as expected, but there was less glare from the yellowish halogens. Smarter people than me can tell you which colour will reduce fatigue but I suspect it would be the HID. Forget the blue light sabre beam in the HID photos as it is not visible to the naked eye yet comes up clearly in the pics. 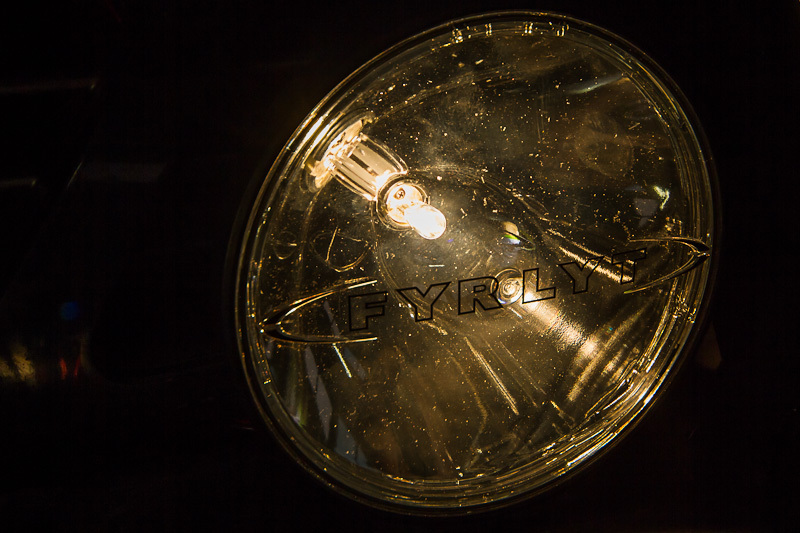 So, to answer the original question, are the Fyrlyt driving lights as good or better than my HIDs? I would have to say that the answer, in this test, is no. Are they better than a cheapish HID conversion kit? Can they be better than HID? I think if I can get closer to 13volts to the lamps then yes they will be. Fixing my wiring made a dramatic improvement and there is more to be gained. Fyrlyt recommend a wiring loom in their documentation that may be worthwhile investing in. Are HIDs still the undisputed king? Nope. Have a look at LED Light bars if you want/need/crave the ultimate illumination. Which ones am I going to run with? At this stage I have now fitted both Fyrlyts to the front of the Patrol and am really really impressed with their instant on output. I’m running both of them in spread beam configuration and, without the HID alongside to compare with, the lighting is seriously WOW. A couple of road, and offroad, trips with some night driving will be the decider but so far…….…. I like them….. a lot. Thanks for the Fyrlyt post. I’m tossing up between the Hella 4000s in a driving pattern or the Fyrlyts right now. Some updated thoughts on these lights would be great. There appears to be a real lack of information on the Fyrlyt, no beam patterns apart from the few you’ve put up seem to exist. Is there any chance you’d be able to post some beam pattern shots of your Fyrlyts Vs the Hella 4000s? An against the wall type shot with only one lamp running would be really helpful to lots of people looking at buying these lamps. Any comments on the spread compared to the Hella drivers? Love your photography too, you have some great shots in your collection. I’m also a keen photographer. Hi Andrew, thanks for your review and comparison. I am buying a new 4WD and am considering my driving light options. Despite surfing the internet, yours is the first comparison of FYRLYT I have come across. 4WD Action did an interesting comparison http://www.lightforce.net.au/images/pages/4WD%20161%20LR2.pdf where they included not just lighting but water submersion and impact resistance tests. Pity FYRLYT wasn’t part of the test. I might just take FYRLYT up on their invitation to contact them, and ask where to find comparisons and their thoughts on how the product would stand up to submersion and impact. I must say, the ease of replacing parts is very attractive, and i like the idea of a sacrificial lens that also acts as a cover. I’ll let you know what I turn up. The voltage drop to halogen lights ‘ie bad wiring’ is the most significant factor to good light output .